Found a neat video this week for the lotus flower. The Sweet Sunday Sketch was a great fit for featuring my find. Hope you enjoy. Did you know you can purchase my blog cards? Check out this link on Etsy! 1. 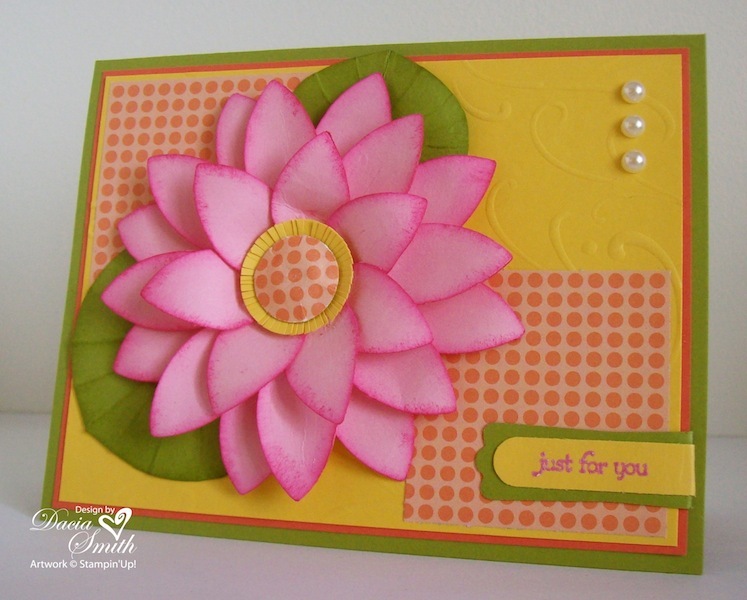 The flower petals are made using the Blossom Petals Builder Punch, and can be found in the 2011-2012 catalog! 2. The Just Add Cake Designer Paper features one of the new in colors, Peach Parfait. 3. The Summer Mini catalog offers embossing powder in three delicious colors. Each will carry over to the new catalog along with Cherry Cobbler and Tempting Turquoise. The sentiment is embossed using the Melon Mambo Embossing Powder. This one features the new in colors debuting July 1 in the 2011-2012 Idea Book and Catalog. Place a $75 order through my website and I will mail you a free catalog! 1. The Pennant Parade Stamp Set will be available for order July 1. 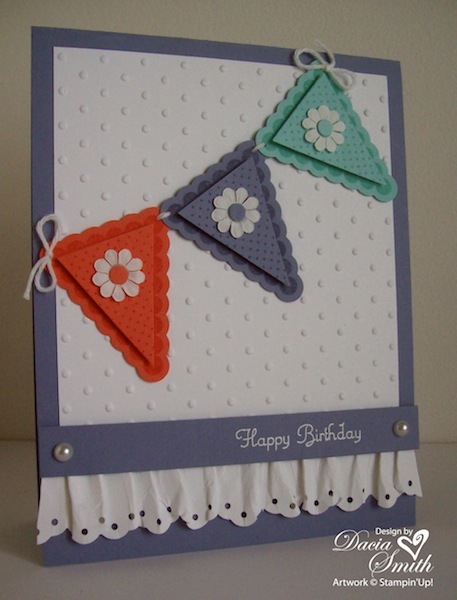 There is also a coordinating Petite Pennants Builder Punch for easy cut out. Isn’t Stampin’ Up the bomb! 2. The flowers are Stampin’ Up’s Paper Daisies, a great buy at 40 for $6.95. The circle center is from the Cupcake Builder Punch. It is the exact size of a Glue Dot for easy attachment to the daisy center. 3. The embossed polka dot background and paper lace give this one a girlie touch. Wow, it didn’t need a snip of ribbon. Playing the Sweet Sunday Sketch (SSSC122) with Karen over at the sweetest thing as I get back into the swing of things. 1. The flowers were stamped using the misting technique. Color your stamps with Stampin Write Markers and mist a little water before stamping. Produces a great watercolor effect. 2. The Perfect Details Texturz Plate added a great texture for the background. Looks a little like a trellis. 3. 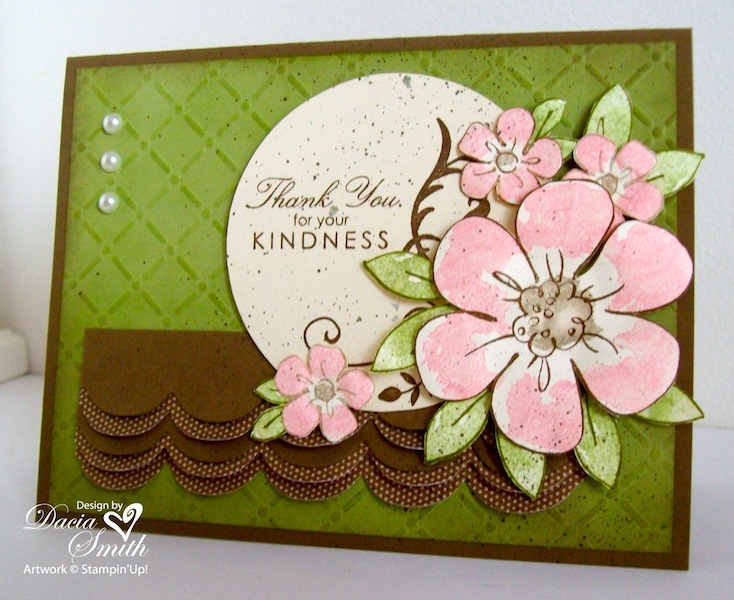 The Spritzer Tool creates a subtle aged vintage look to any card. Just slipped in a Soft Suede Stampin Write Marker and squeezed the barrel. It passed air across your marker spraying a fine mist of spattered color. Created my first easel card for my son to give his father today. The picture was taken last summer on a mission trip to Lumberton, Georgia. 1. 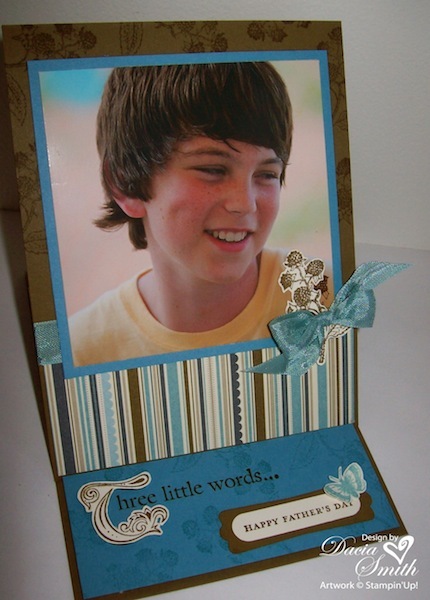 Add extra punch to your stamped greeting by layering with a different color card stock. 2. The Baja Breeze Seam Binding Ribbon is soft and ties effortless bows. 3. 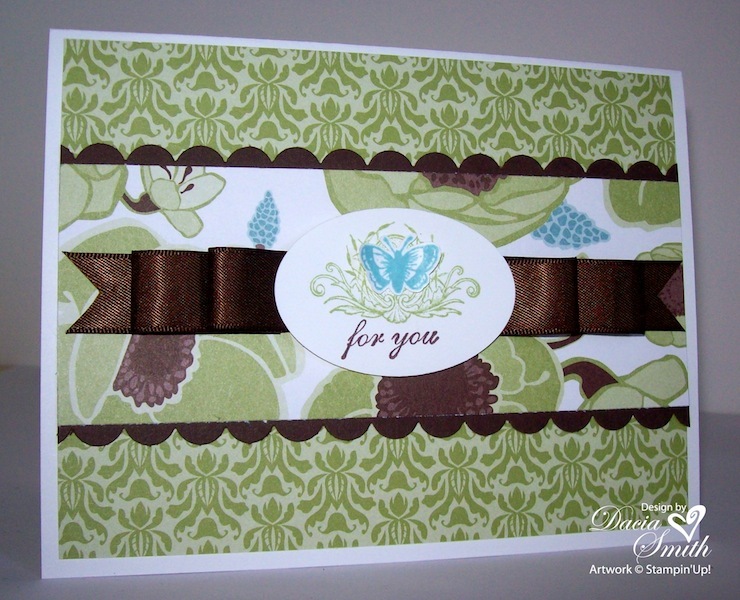 Create a subtle background on your solid color card stock by stamping a tone on tone image. 1. You can change the Clearly for You stamped image with a little layering. The butterfly was stamped, trimmed using the Paper Snips, and mounted with a Glue Dot. 2. The folded ribbon technique is easy and great when mailing your card. Cut several pieces, fold each in half, and seal open ends. Stagger and attach to base using Glue Dots. 3. The stamped image fit nicely in the Extra Large Oval Punch.